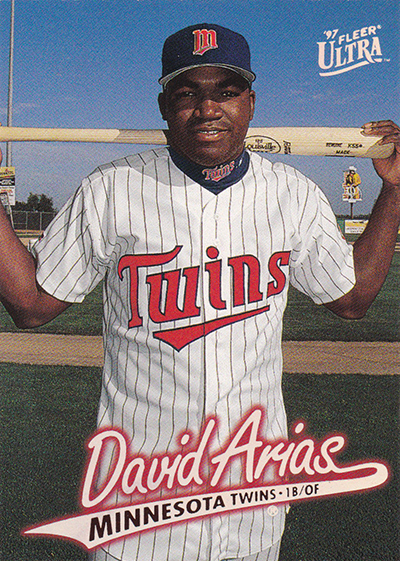 Little was known about David Arias when he debuted for the Minnesota Twins on Sept. 2, 1997. He’d toiled in the minor leagues for several years with Seattle Mariners Single A affiliate the Wisconsin Timber Rattlers. He joined the Twins as the “player to be named later” in a transaction between the two teams involving third baseman Dave Hollins. And while Ortiz didn’t actually change his legal name — it had always been David Américo Ortiz Arias; Arias is his mother’s last name — the choice for him to use Ortiz as the last name on his jersey was a way of reflecting his new direction, as well as a new lease on his career upon joining the Twins. (Peter Leventhal) has seen a “meteoric” price increase on collector’s cards this year as Ortiz has gone on his age-defying run. When Ortiz signed as a free agent with the Boston Red Sox in 2003 after being released by the Twins, it’s said that many collectors didn’t make the connection between Arias and Ortiz. This resulted in high-value David Arias rookie cards selling for less than $1 for half the season before collectors finally caught on. With its thicker stock and glossy finish, the Ultra “Ortiz” card was selling for upward of $15 by the end of Ortiz’s first season in Boston. During that first year, Ortiz put up All-Star-like numbers, including 31 home runs, 101 RBIs, and he batted .288. This far exceeded what he’d done in Minnesota. Today, as Ortiz heads into his final postseason with the Boston Red Sox, his final Arias ’97 Fleer Ultra rookie card, a “parallel card,” sells for upward of $119 on the collector’s market. In the collecting world, parallel cards typically feature identical player images, but will have unique touches — such as different foils or materials. In the case of the Arias card, each one of those parallel cards featured a different image of Ortiz, including the “Gold Medallion” version and a rare “Platinum Medallion” version that is so scarce that it rarely appears on the open market. Ortiz’s offensive output, including the Sox’s single-season home run record of 54, places him in the top class of many statistical categories with Red Sox greats such as Ted Williams, Wade Boggs and Manny Ramirez. And while Ortiz sports cards have a way to go before they reach the value of Williams’, (some valued at upward of $11,000), the company Ortiz keeps in Boston is iconic. There’s no shortage of cards for collectors. In the same year as the aforementioned Ultra card, Fleer issued another Ortiz rookie card in its regular series that featured a swing ready Ortiz. This card was printed in limited quantities and was dubbed the “Tiffany” version for its use of the famous Tiffany blue color. “For every 20 regular Fleer Rookie cards, only one Tiffany Rookie was made,” said Leventhal. “Problem with this card is, no one knows how many Fleer cards were made, so who knows how many Tiffany cards are out there?” Regardless of the number, the “Tiffany” version fetches between $300-$400 in today’s market. Will he be a first-ballot Hall of Famer? Do David Arias and David Ortiz deserve to be in the National Baseball Hall of Fame at all? Currently, former Chicago White Sox slugger Frank Thomas is the only player in the Hall of Fame who spent at least 50 percent of his career as a designated hitter. Save for a few years scattered throughout, Ortiz has spent almost his entire career as a DH, a feat some say extended his career by allowing him to put up massive numbers without the physical wear and tear of a regular defensive position.